Lovely sunny day as the Fylde Golf croquet team braved the midweek rush hour to play their last league game of the season on Bowdons beautiful lawns. A strange day, a couple of incidents, and with 5 games going to time, a lot of confusion about the 8 extra balls rule and also the use of ‘bisques’ during this time. Both team captains having a different understanding of the rules. Congratulations to Bowdon on their win and thanks to Jean for coming to support us. Fylde made a steady start by winning 3 of the first 6 games. Alan scored 3 consecutive jump shot points in his 7-4 win over Ken. Janet made an impressive start by beating Margaret 7-6 and Ian also beat Margaret 7-2. At the halfway stage ,Fylde were 5-4 in the lead. Bury East had mathematically won the League and only needed a point to secure the Championship but Fylde were making them work for it. Bury gained the advantage by winning 4 of the next 6 games. Therefore with 3 games to play, Fylde needed 3 wins for victory and 2 to make a draw. Janet finished with a 7-4 win over Ken. Ian lost for the second time in a tie break with David 6-7. Alan secured the draw with a 7-5 win over Margaret running the final hoop from 11 yards. Rain showers at times in the morning, sunny afternoon. Sue was the only Fylde winner when she beat Ken 7-4. Judith scored a 21 yard hoop at Hoop 4 on her way to beating Alan 7-5. Alan beat Derek 7-4, Janet beat Judith 7-3 and Cyd beat Ken 7-3. Sue lost 5-6 to Margaret in the time turns. Janet provided an excellent lunch which was much appreciated by all. Jean and Valerie came to watch the afternoon games. With the match at 8-6 to Bury, Fylde had an outside chance of winning the match but had to win all 4 games. Alan beat Ken 7-3, Janet beat Margaret 7-5 and with Cyd beating Derek 7-6, Fylde earned a draw. Fylde had an extra turn advantage in 16/18 of the games. However Bury South played well and had enough experience to be in the lead until the last match. However, Janet secured the draw. Alan triggered a return to Handicap 5. Janet triggered a return to Handicap 9. Culcheth Bob Connop(0), Brian Poynton(4), Ann Connop(5) and Mark Frayne(8). Jan and Cyd took on Bob and Mark and the game went to the golden hoop. Luckily Janet had saved a bisque and managed to take the hoop. Philip and Geoffrey took on Brian and Ann, and with the help of some great shots from Geoffrey won 7/5. Janet beat Ann 7/5, Mark 7/3, Bob 7/4 and lost at golden hoop to Brian. Philip beat Mark 7/5 and lost to Ann 7/1, Bob 7/5 and lost out on the golden hoop to Brian. Geoffrey beat Bob 7/2, Ann 7/4, lost to Mark 7/4 and drew the game against Brian which went to time 6/6. Cyd lost 7/6 to Bob at the golden hoop, lost 7/5 to Brian, 7/2 to Mark and 7/5 to Ann. Fylde were leading at lunch 6 games to 3 plus one drawn but things went downhill after the break winning only a further 2 games. A great big thank you to Aileen who came and helped out with lunch. A cloudy day and tricky lawns. Three wins for Fylde with Alan beating Roger 7-5 and Wyn 7-5. Philip beat Wyn 7-6. Only 2 wins recorded in this session with Alan completing the double over Roger and Wyn. Maureen won all of her 6 games. 13 games were closely contested until the 12th or 13th point and although Fylde won 5 they were very close in the other 8 games which was a good effort on lawns that are always challenging. Dry and overcast with a strong breeze. Fylde didn?t start well in the first 6 games with only Alan beating Bob 7-4. 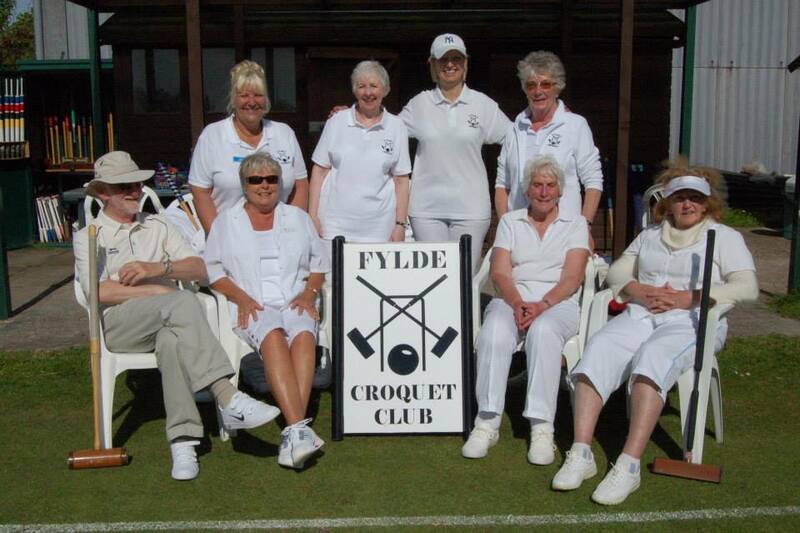 However, Fylde won the next 3 games with Janet winning her first game by beating Anne 7-5. 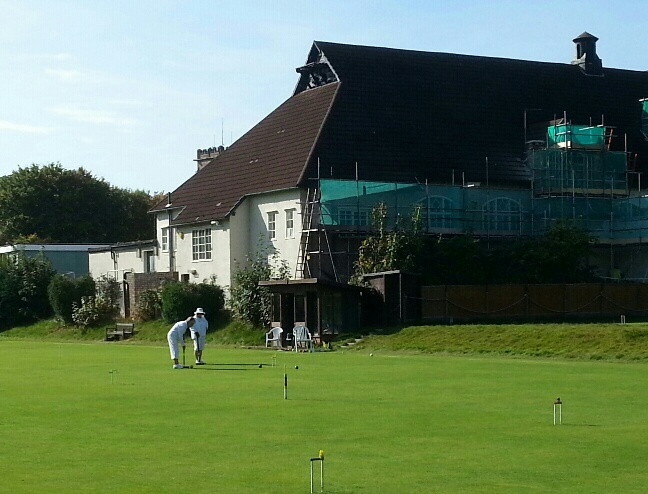 At lunch ,the match stood at Fylde 4 Culcheth 5. In the second half only Ian won beating Brian 7-4 and Culcheth won eight games to seal the victory. There were 3 tie breaks which were all won by Culcheth. Fylde: Jan Smith 10, Geoffrey Lipshaw 12, Cyd Harbottle 12, Aileen Watt 12. Chester: Gary Greenwood 3, Roger Haig 8, Janet Jackson 10, Christine Thomas 10. Another hot and gloriously sunny day on the Fylde coast. Geoffrey won 1 game beating Roger 7/3 and losing to Christine 5/7, Janet 4/7 and Gary 3/4 in a game which went to time. Cyd lost to Gary 5/7, Roger 6/7, Christine 2/7 and Janet 2/7. Aileen beat Roger 7/5 and lost to Gary 3/7, Janet 6/7 and Christine 4/7. A fabulous day with lots of banter and a sumptuous lunch that was very much appreciated, and thank you to Alan Morton for coming and helping out with the drinks and more importantly, the washing up lol. Star of the show was Aileen on her debute, starting off in her first doubles match scoring the first two hoops and playing really well to help win the match. She then went on to win her first singles match and taking another to the golden hoop. Well done Alien X.
Gary from Chester was informed of the new ‘effective’ handicapping system which meant as a handicap 3 player he had to give us all an extra bisque (oops sorry 'extra turn' x). Jan triggered handicap 9 (but no Mars bar this time lol). In the doubles, Catherine and Geoffrey bt Don and Gail in a close match 5-6, courtesy of some great hoop running by Geoffrey. Janet and Cyd narrowly missed out at Golden Hoop in their game. In the first singles round, Fylde won two games and drew one. In the next round the teams won two games each taking the score to 4-5 at lunch. After lunch Southport took three of the first four games to lead 7-5 but Fylde fought back and won all the reaming games to win 7-10. It was a tremendous achievement by the team against strong opposition. Janet and Geoffrey won three singles games each, Catherine won two singles and Cyd drew one and fought back at the end to win her last game. JS : bt GM 7-4, bt MB 7-4, lost DW 2-7, bt MC 7-5. Fylde made a good start by winning 5 of the first 6 games. Alan scored 4 hoops with cannon shots in his first game with Joan. Margaret scored Bury's first win beating Alan 7-6. Bury added two more wins making the score Fylde 6 Bury 3 at the halfway stage of the match. The afternoon session saw Fylde take control of the match with 7 consecutive wins with Ian and Catherine scoring with jump shots and cannons. Alan ran hoop 2 from 20 yards against David as part of his 7-4 win. Ian and Alan will receive a Mars Bar for their stellar performances. Janet was presented with her 'LLanfairfechan' Mars Bar prior to the start of the match. Janet and Cyd won their doubles 7-4 to gain the first points of the day. Fylde gained an advantage with Janet beating Fiona 7-2, Cath beat Eve 7-4 and Sue beat Ian 7-3. Fylde now led 6-4 at the lunch break. Janet beat Ian 7-6 and Cyd beat Eve 7-5. Fylde needed two wins to secure the points. Cyd lost 4-7 to Fiona, Cath lost 3-7 to Ian so all to play for. Sue drew the match by beating Eve 7-5 which left Janet and Nancy to decide the outcome. In a very close game Nancy hung on to win 7-6 and earn a draw for her team. A very hot day with Players feeling the heat during the final round. Everyone enjoyed the day's croquet and in particular Janet and Cyd who successfully executed jump shots.Congratulations to Janet who triggered Handicap 10. The visitors arrived in good time and good humour, fielding two rookies and having Georgina as a non- playing captain. The Fylde flag flew against the beautiful blue sky and the sun shone for the entire day. After the first round of doubles the scores were even. Digging deep the Llanfairfechan team carried on with fortitude in the last round, and battled on bravely, unfortunately losing two games on the golden hoop, and in the Sue versus Richard game, it was tied 6 -6 after time turns. Janet Smith won Alan's Mars Bar for man of the match winning all her games, triggering a handicap reduction to 11. Cyd won 3 out of 4 of her singles matches as did Betty who triggered a handicap reduction to 4. Sue won two games and drew one. The Fylde rookies , who are growing in confidence, offered helpful advice to the Ll. Rookies. The games were played with friendly banter and a good day was had by all. FYLDE: Ian Theakstone (5), Betty Bates (6)Alan Morton (6). PENDLE: Paul Dowdall (3) Hugh Armitage(7), Robert Hall (9). Fylde led through the whole match. At Lunch 12 games had been played with Fylde leading 9-3. Ian won 5/5 plus a walk over to give him a perfect score 6/6, Betty won 5/6 and in her games she won 12 hoop points with successful jump shots. Betty also triggered Handicap 5, Alan won 2/6. There were four tie break games with both teams winning 2 games each. A good win with good form from Ian and Betty who both get a Mars Bar for their stellar performances. The weather was dry and sunny for our first visit to Ellesmere. Ellesmere had to concede 3 games because of an accident to Joan Walker who was unable to continue after a fall . It was later confirmed that Joan had broken both her wrists and a card has been sent on behalf of the Fylde team with their best wishes to Joan for a speedy recovery. Janet won 3 games beating Betty 7-3, Sue 7-3, and Viv 7-2 . A good team effort with everybody contributing to the win. Janet had a very good day in winning all her games and so will receive a Mars bar for a stellar performance. Cath and Sue lost to Vi and Susan 7-5. 1. One wrong ball, full penalty fault when a player played when it was not their turn to play. 2. An air swing made contact with the lawn and the striker called a non-striking fault. There was no repair to any damage and as there was no deviation test requested it may not have been a fault. 3. If you are 'thinking' of taking an extra turn then state that at the end of your turn to stop your opponent from playing. This season will be an opportunity for our new players to gain experience by playing competition croquet as well as enjoying their games. I wish them an enjoyable season.